May 2019 - 13 night gap from 17th - 30th May. Special promotion - Only £90 per night. Price inclusive of all taxes, final clean, use of Wi-fi and a safe. This exclusive luxury property, has 59 Trip Advisor reviews and their Certificate of Excellence. 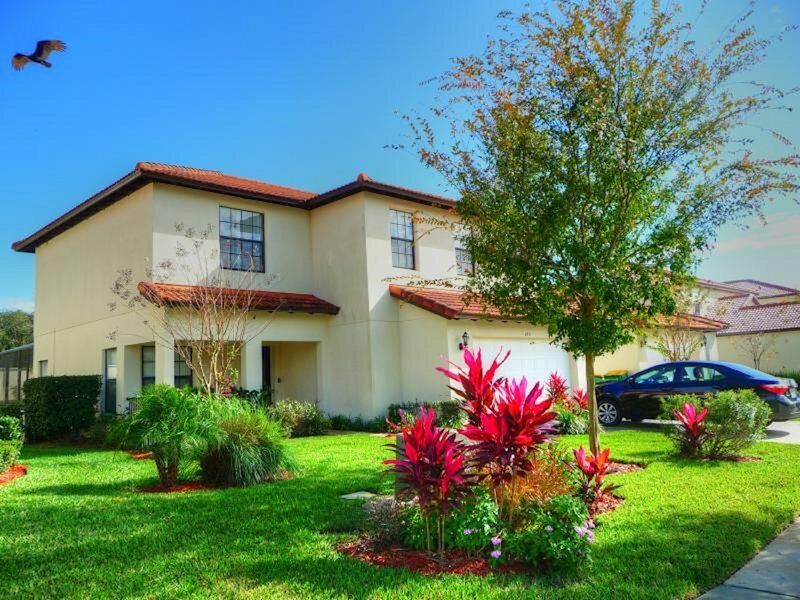 The villa has beautiful Italian themed fixtures and fittings and is set in the highly desirable, prestigious community of (Tuscany/Calabria) surrounded by small lakes, conservation area and Florida's woodlands. Easy and quick access to Disney World, only 3.8 miles from West Gate of Disney World so you really can be there in under 10 minutes. The villa offers a fully automated Jacuzzi and swimming pool - length 27 feet. The beautifully landscaped front and in particular rear tropical garden is a unique feature of this villa. Guests can enjoy fibre cabling directly into the villa, providing 100Mbps download speeds, stunning HD digital television on a 70 inch screen, the use of NETFLIX and excellent WiFi provision. The villa is in an ideal location only 3/4 mile from the 192 with its endless range of restaurants and shops. 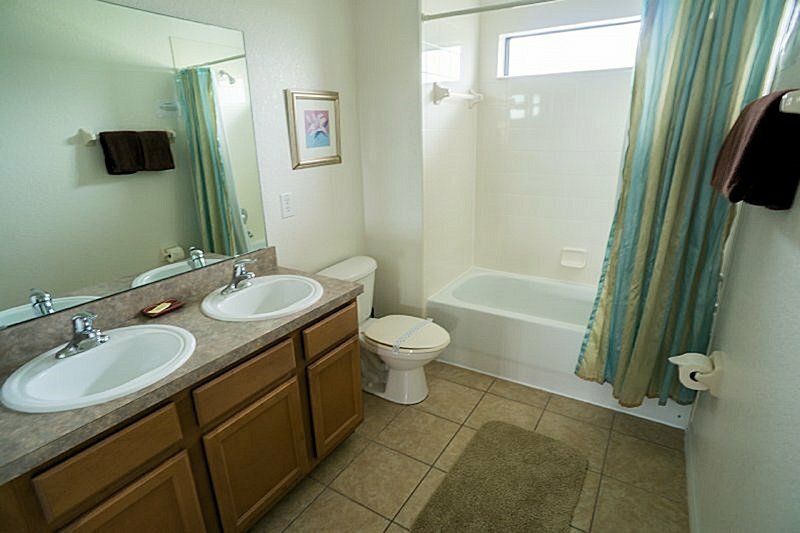 Easy access to the interstate 4 and highway 27. 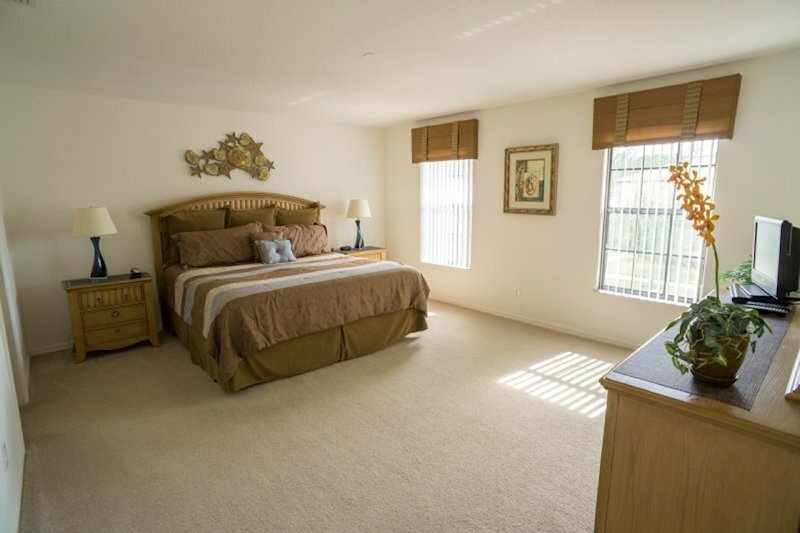 The villa really is in an ideal location, a peaceful oasis,just 3.8 miles from the new West Disney gate. Be in DISNEY WORLD in literally a couple of minutes, avoiding the busy 192. The villa, fully air - conditioned throughout, offers an open concept of living arrangement downstairs and the upper storey offers 4 very spacious bedrooms. The villa is a much loved holiday home and we as owners visit 4 times a year. Photographs are regularly updated to reflect changes and give an accurate picture of the villa and garden The additional landscaping has been completed by my wife (whose hobby is landscape gardening) in the last 4 years. This is what makes this villa quite unique and guests return year after year. The garden has flowering oleanders, azaleas, camellias, hibiscus and a variety of perennials, grasses and palms. Even in January the garden is in flower as can be seen in the main photograph - taken January 2018. 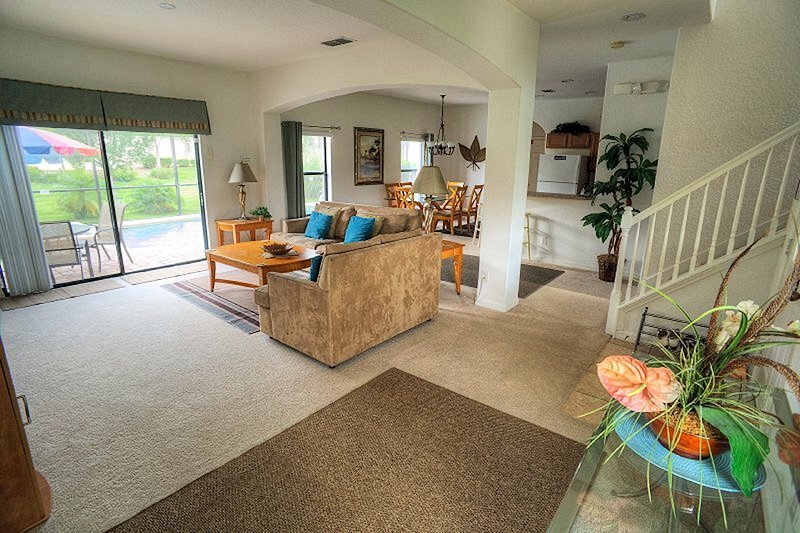 Ideal for two families on holiday together, it is fully air-conditioned with a large, light-filled open plan, spacious, airy living/dining room with cable television (huge 70 inch Vizio Smart TV). Netflix. Davella is looked after by the owners who visit 4 times a year and a local management agency, resulting in a well cared for villa. Check our Trip Advisor reviews, including very recent ones, that speak for themselves. Davella is 3.8 miles from the West Gate of Disney. You can be in the world in less than 10 minutes. This is the quiet route in. The villa lies in a beautiful development of houses, that are both holiday and residential, giving added security. Gated communities are not necessarily secure and often involve queueing at busy times of the day. Minutes drive from restaurants, shops, giant supermarkets, garages. The large pool and spa is screened by hedging and tropical plants and looks out over the landscaped rear garden. Most villa pools are overlooked with no privacy. Fibre cabling with 100 Mbps download speeds. 70 inch and 46 inch T.V's with Netflix. Why watch American adverts? Safety pool alarm system for children. Games room.for fun with all the family. No hidden extra charges such as cleaning and taxes. Charcoal B.B.Q for use in the garden. The only extra is pool/spa heating at £16 per day and this is only required in the winter months as we have solar pool covers and the pool area gets sun all day. "Perfect holiday base Left on Feb 12, 2019 for a stay in Dec 2018 Stayed here with my boyfriend for a week in December and it was the perfect base for our holiday. Close to all of the main attractions as well as Walmart and lots of restaurants, had pizza delivered very easily. 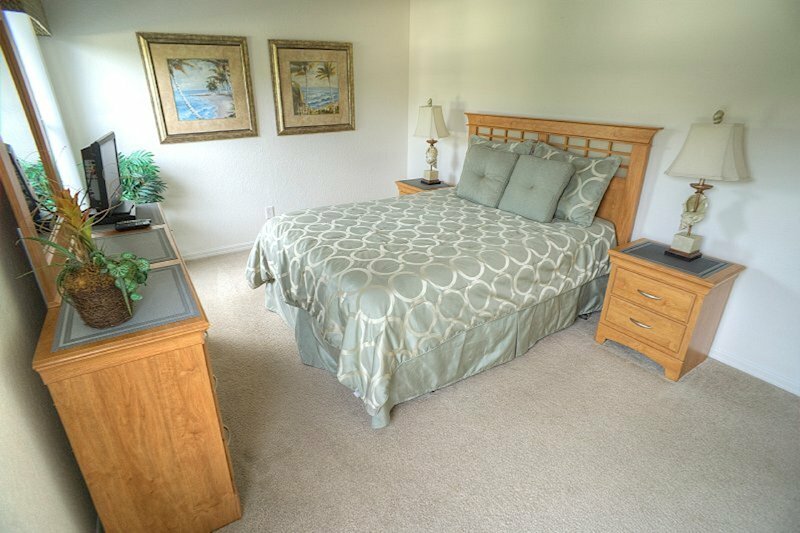 The house was spacious and clean - loved the huge bed in the master bedroom, very comfy! Would definitely stay here again." 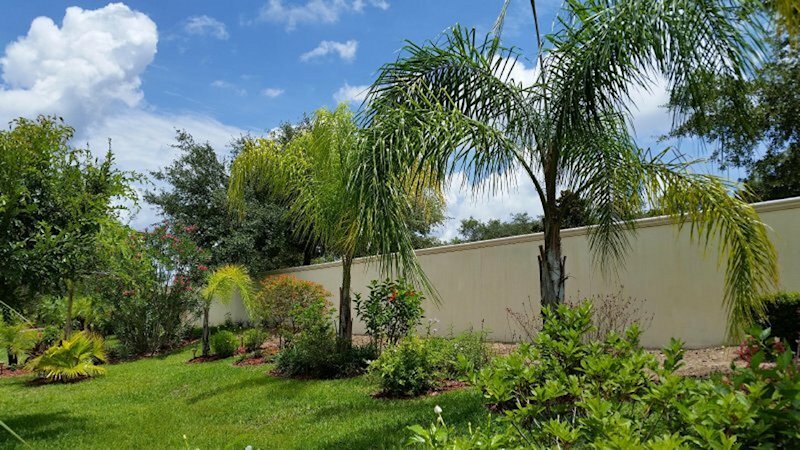 "Richard C London, United Kingdom Truly fantastic property and in a great location Left on Aug 26, 2018 for a stay in Aug 2018 Easy to find, this property is conveniently located on the edge of Kissimmee on a very small estate near the 192. A great base to visit Disney, Seaworld and Universal Studios - which are all just a short, trouble-free 15/20 min drive away. It’s even on the right side of town for visiting Busch Gardens, Tampa. Supermarkets and good restaurants are also very close by. As a party of 6 we were truly impressed with the property. It’s superbly furnished, spacious, clean, tidy and kept in very good order. Everything was 100%+. Everything we needed for our holiday was provided as per the advertisement. Ella was very responsive by email when we wished to clarify a small issue – which was impressive and helpful. I note that all previews convey similar messages about this property let. 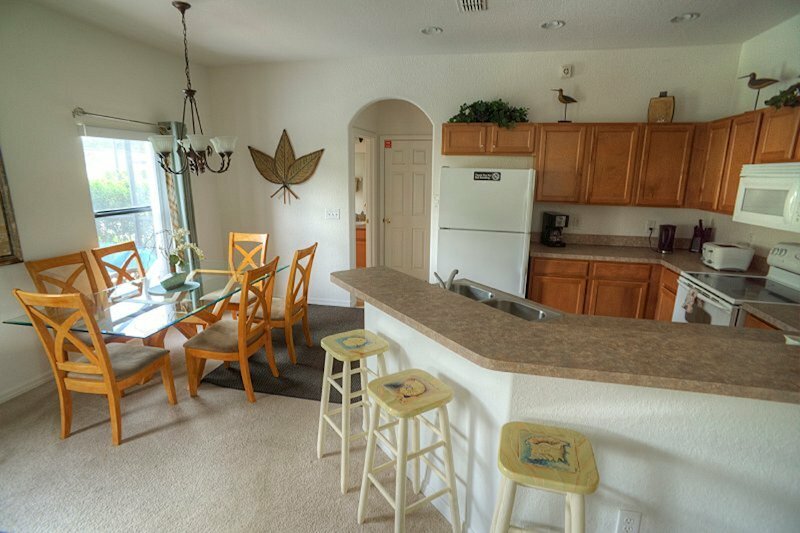 If we visit Florida in the future, we shall certainly look to book this villa again"
"Excellent accommodation within 20 mins of all Disney parks; highly recommended. 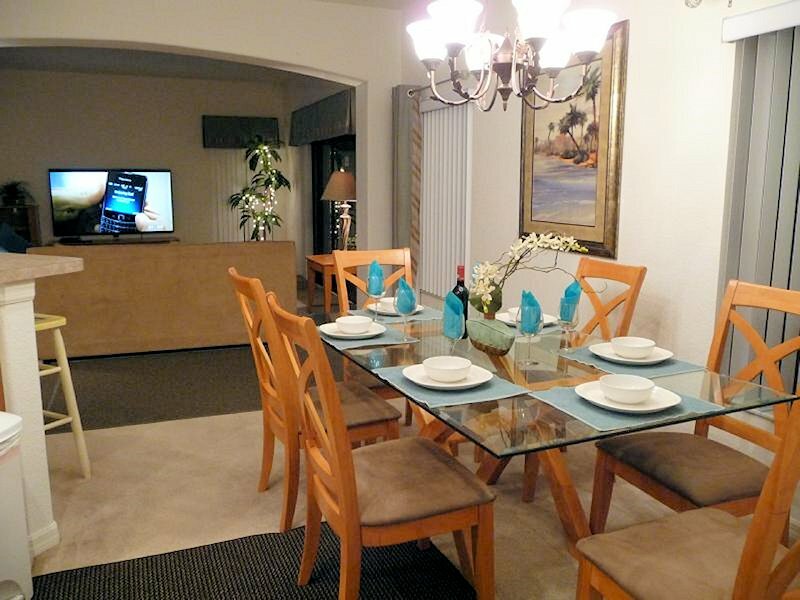 Ideal location situated near the end of the 192, so easy access to all main routes and parks. Accommodation itself was very clean and spacious - lovely pool and situated in a nice quiet neighborhood. We had a fantastic holiday and are thinking about returning next year - we would happily rebook with Ella again." "Ian D Perfect Family Villa on Disneys Doorstep Left on Mar 28, 2018 for a stay in Mar 2018 We booked and stayed in this fantastic villa for 14 days. The villa is very spacious, comfortable and in a quiet neighbourhood. 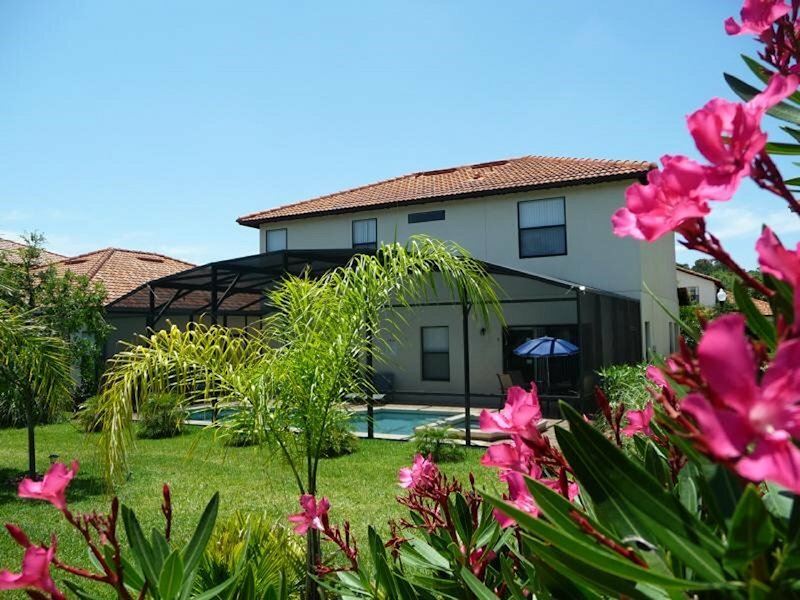 The outdoor pool and indoor games room just added to this perfect villa. It's literally on the doorstep of Disney just of US192/I-4 and getting about is very easy to navigate. We wouldn't hesitate on returning to the villa when we visit Orlando in the future. It literally is a home from home on the other side of the Atlantic!" "Great house, great pool, great location Davella is a great locaton for a Disney/ Universal holiday - its just off the 192 and close to supermarkets, etc. The house is excellent - very clean with all of the things you need. The pool is great for the kids, and the jacuzzi is great for the adults. Ella was always very responsive to our requests. Would highy recommend." "Amazing and spacious home from home. Everything we needed to enjoy a relaxing family holiday. Great communications with homeowners. 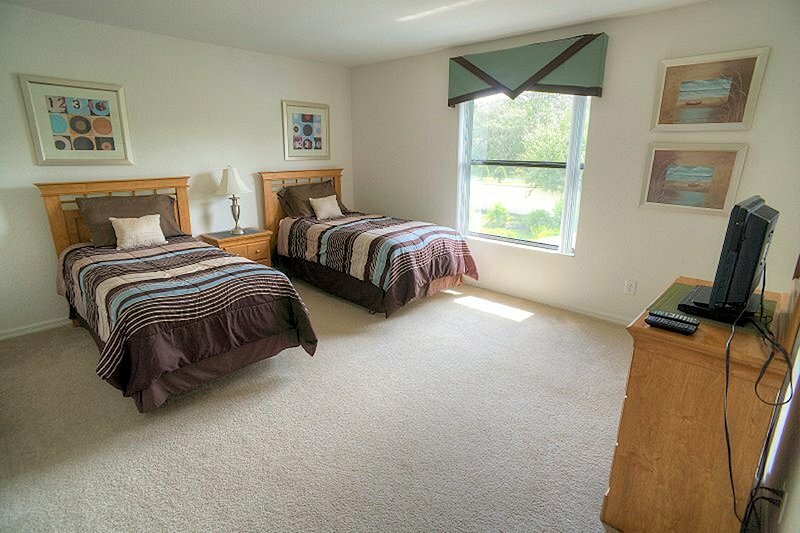 Well maintained and within easy access of amenities and parks. Had a fabulous time and would highly recommend to others." 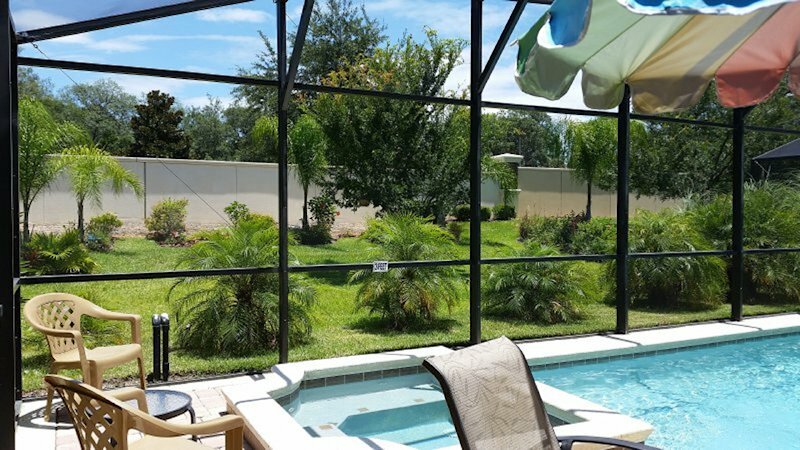 "Gary D Great house, great pool, great location Left on Feb 26, 2018 for a stay in Feb 2018 Davella is a great location for a Disney/ Universal holiday - its just off the 192 and close to supermarkets, etc. The house is excellent - very clean with all of the things you need. The pool is great for the kids, and the jacuzzi is great for the adults. Ella was always very responsive to our requests. Would highly recommend." "Outstanding Vacation Getaway Left on Nov 26, 2017 for a stay in Nov 2017 After a last minute decision to rent a house instead of staying at a hotel we found this home. So happy we did!! 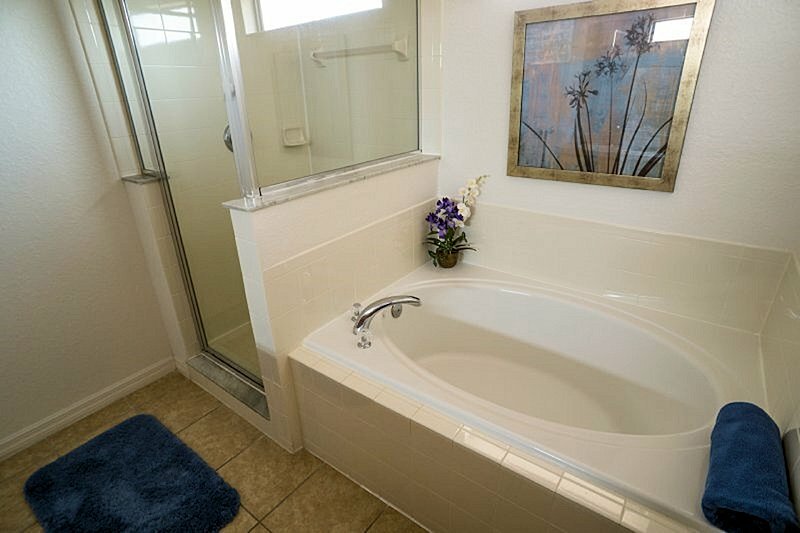 Wonderful, clean, fully equipped!! Plenty of room for the family and my parents who came up to stay. The kids enjoyed the pool and fun game room. Close enough to Disney and all stores. We plan on staying again after the Holidays!!" The following extras are provided FREE OF CHARGE. Secured Wi-Fi internet access. For babies and toddlers a cot, highchair and stroller plus pool safety door alarms and stair-gate. Key operated safe. Late departure where possible. Local telephone calls. Please note that pool/spa heating is an extra and the combined system rate is £16 per day as the pool is larger than the average pool and allows swimming from one end to the other. Heating is recommended in the months of November through to March. Davella is looked after by the owners who visit 4 times a year and a management agency, resulting in a well cared for villa. Davella is 3.8 miles from the West Gate of Disney. You can be in the world in less than 8 minutes. This is the quiet route in. Fibre cabling with 100Mbps download speeds. Safety pool alarm system for children. Games room. Heading towards US192, then east for around a mile, you will find some local eateries, including a Chinese Buffet and a take-away, an Italian, Houlihan's restaurant, Subway, MacDonalds and more. There is also a local 7-Eleven convenience store. Head a mile further and there are more well known restaurants, including Bahama Breeze, Longhorn and Olive Garden. Here you will also find a Publix supermarket and a liquor store. Heading in the opposite direction on US192, there is the Formosa Gardens Village shopping complex, which has a pharmacy and walk-in medical centre alongside other shops (and an ATM cash machine). The nearest Walmart is just over 3 miles away from Calabria Westside. This is located west on US192, then north on US27. Ideal for two families on holiday together, the downstairs, interior designed living area is fully air-conditioned with a large, light-filled open plan, spacious, airy living/dining room with cable television (huge 70 inch Vizio Smart TV). Netflix. The living and dining areas look out over the pool and spa area and also have stunning views over the tropical garden. The tropical garden is a unique feature of this villa and the palm trees offer shade on even the hottest of summer days. The spacious living area offers extra sleeping accommodation with a double sofa bed. The spacious, fully fitted kitchen with large breakfast bar has all modern appliances including waste disposal Kitchen is well stocked with crockery, cutlery and glasses, coffee maker, toaster and blender. There is a large walk-in utility room with washing machine, separate large tumble-dryer, iron and ironing board. Upstairs there are 4 very large luxury bedrooms and 2 bathrooms. All the bedrooms have beautiful bed-linen, luxury carpeting, light wood furnishings and DVDs. The huge king size bedroom with walk -in dressing room has spacious en suite facilities with twin vanity units, large, deep corner bath and large separate shower. Also a separate toilet. Fibre cable T.V and D.V.D player. The 2 large windows overlook the front garden and landscaped areas of villas opposite. Looking out towards the conservation area the queen bedroom also has a large en-suite bathroom with overhead shower and twin vanity units. Also spacious built in wardrobes. There is a twin bedroom ( ideal for children or adults) at the front of the villa, looking across to beautiful villas and landscaped gardens. The other twin bedroom, a huge room, looks across the rear garden towards the conservation area. All bedrooms have built in wardrobes, D.V.D players and they all have lovely views over the garden. The villa and garden gets the sun from sunrise to sunset. The rear tropical garden is a really unique feature of this villa. Created by the owners over the last few years, it offers guests a beautiful area to relax in.Tropical birds visit the garden as well as giant butterflies and hummingbirds, attracted by the many flowering plants. Overlooking the landscaped rear garden, the private pool and spill over spa with jets is set in a decked area - alarmed for child safety and is a lovely area to relax on the sun loungers in the Florida sunshine. 8 sun - chairs, 2 sun-loungers, picnic table and umbrella complete the picture. Relax beside the pool or sit in the garden under one of the many palm trees and enjoy the sunshine and the flowers. All towels provided except for beach towels. A 10 foot high wall, separating the garden from a quiet minor road, means that the villa is not overlooked from the rear. The pool area is also screened by hedging plants.The back bedrooms of the villa have a lovely open outlook towards the conservation area. Hot air balloon trips can frequently be observed at dawn as they float over the villa to land in nearby fields. An amazing spectacle. 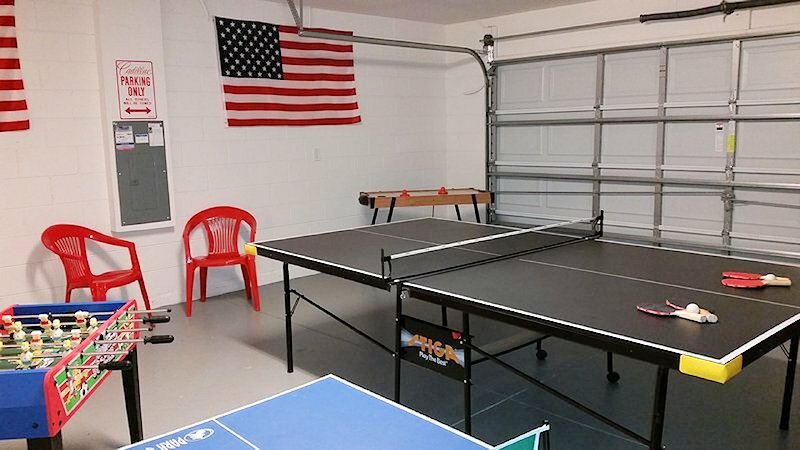 There is also a games room, making use of a large garage space.Fun for all the family! It offers adult table tennis Stiga Optima table plus another small table tennis for children, foosball and air hockey. There is also a wall mounted 46 inch wall fibre cable T.V with D.V.D player to keep the children happy. Selection of pool toys kept in storage basket. You can enjoy privacy.The large pool and spa is screened by hedging and tropical plants and looks out over the landscaped rear garden. Most villa pools are overlooked with no privacy behind or on either side.